Eyewear is very glad to welcome Kathryn Simmonds (pictured) this Friday. Her first full collection Sunday at the Skin Launderette was published earlier this year and is a Poetry Book Society recommendation; it is also shortlisted for the Forward Prize for Best First Collection. 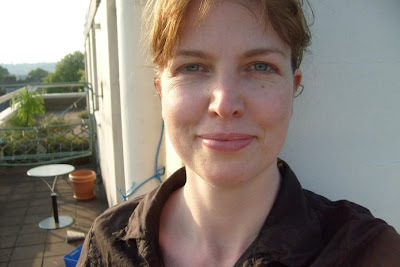 Her work has appeared in a number of journals including Poetry London, The Guardian and The Scotsman. In 2006 she won the Poetry London Competition. Like many of the leading younger British poets of the moment, she has an MA in Creative Writing - in this instance from the University of East Anglia. Simmonds also writes short stories. She works as an editor and lives in north London. ignore the compass wavering north/north west. with tinkling bells, you child of Hare Krishna. kept it quivering in a matchbox for a year. Enjoyed this immensely. Nice idea behind it, I thought. Enjoyed the poem (and the collection - congrats to Kathryn on the Felix Dennis Prize). I like the catalogue of human types, reminiscent of Horace I,i (fuller comments here). America In Georgia: The New Airlift?